UNITED NATIONS Syrian Foreign Minister Walid al-Moallem accused some U.N. Security Council members Monday of supporting "terrorism" in the country in a speech clearly aimed at the U.S. and its allies who support the opposition. Addressing the U.N. General Assembly's annual ministerial meeting, al-Moallem said peace requires Turkey, Saudi Arabia, Qatar, Libya and others to stop arming, financing and supporting the opposition  as well as by Syria. He also alluded to the anti-Islam video that provoked violent demonstrations around the Muslim world. "This terrorism which is externally supported is accompanied by unprecedented media provocation based on igniting religious extremism sponsored by well-known states in the region that facilitate the flow of arms, money and fighters through the borders of some neighboring countries," he said. The Security Council's major powers remain deeply divided over the 18-month Syria conflict. Russia and China, key backers of Syrian President Bashar Assad, have vetoed three resolutions by the U.S., Britain and France who back the opposition and have called for Assad to be replaced. 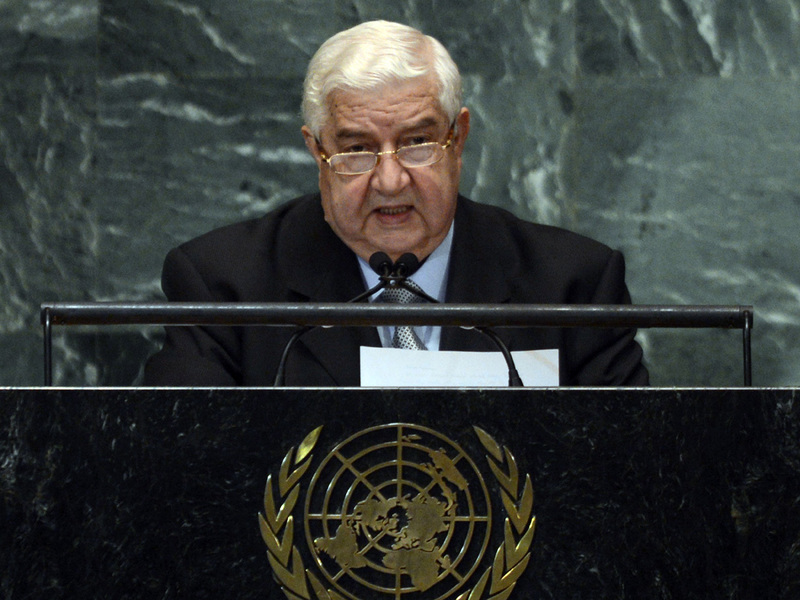 Al-Moallem insisted that some countries are interfering in Syrian domestic affairs. "We heard calls from this podium, and on other platforms, some calls from those who are ignorant of the facts or maybe ignoring them, or also from those who are shareholders in exacerbating them, that invites the President of the Syrian Arab Republic to step down," he said. "This is a blatant interference in the domestic affairs of Syria, and the unity of its people and its sovereignty." Al-Moallem called for a political solution and Syrian-led dialogue to agree on a roadmap to "a more pluralistic and democratic Syria." He invited the opposition to "work together to stop the shedding of Syrian blood."